In this article, you’ll discover insights from new research that show how listeners consume podcast content, and what might keep people from tuning in. 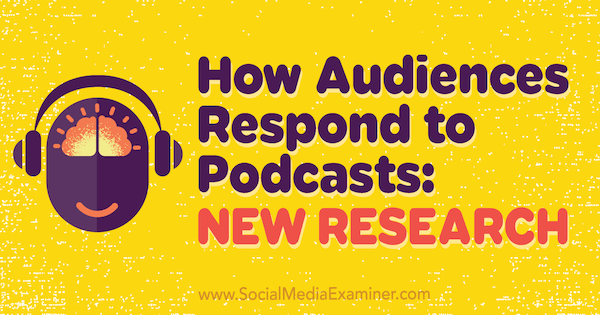 How Audiences Respond to Podcasts: New Research by Michelle Krasniak on Social Media Examiner. 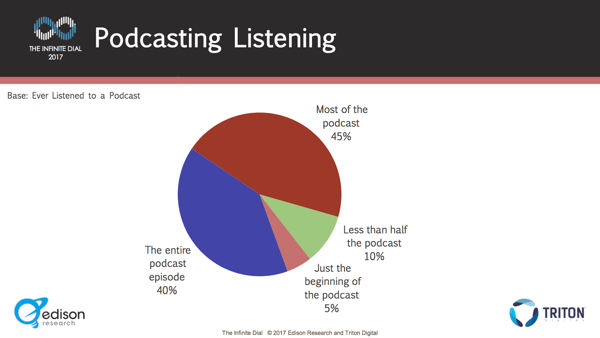 A January 2017 phone survey of 2,000 people by Edison Research (The Infinite Dial 2017) revealed that only 60% of people were familiar with what “podcasting” even meant. (They estimate that to be about 168 million people.) Furthermore, only 40% of the respondents (approximately 112 million people) have listened to a podcast at all. Only 60% of people know what a podcast is. If 40% of people don’t know what a podcast is, are podcasts worth the time and money to create? Should advertisers even bother if no one is going to hear their ads? The number of people listening to podcasts has grown steadily year over year. Social Media Examiner’s 2017 Social Media Marketing Industry Report discovered that 60% of the over 5,700 respondents have no plans to use podcasting in the coming year. It’s been around for over a decade but isn’t growing in popularity or adoption as quickly as other types of content such as visuals. Still, 45% of respondents say they want to learn more about podcasting. 45% of marketers want to learn more about podcasting. Just because marketers aren’t creating their own podcasts doesn’t mean they’re not dipping their toes into the pool, however. A recent study by Bridge Ratings projects that podcast ad spend will see 27% growth and reach nearly $250 million by the end of 2017, up from around $190 million in 2016. 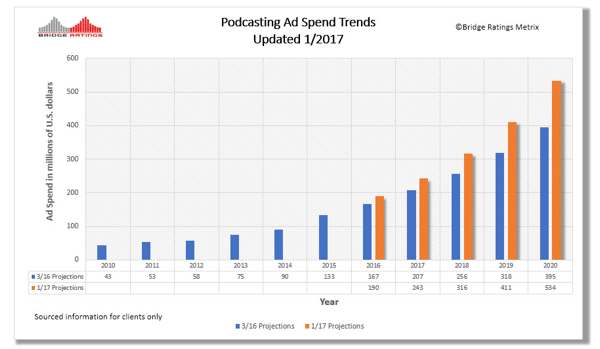 Projected 2017 ad spend on podcasts. Podcasting isn’t completely dead in the water, of course. In fact, the number of people listening to podcasts is growing at a pace similar to that of people listening to online radio through services like Pandora or Spotify. 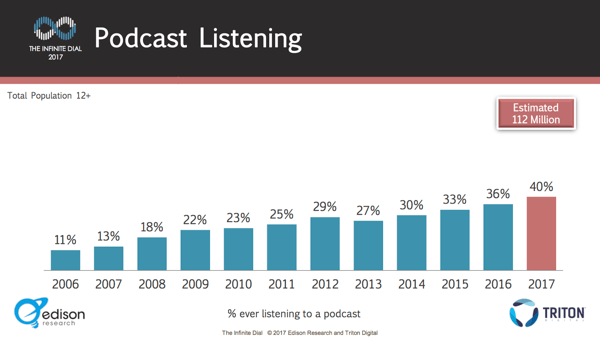 According to Edison Research, the number of people who listen to podcasts monthly grew 7% between 2015 and 2017 (17% to 24%) and monthly online radio rose 8% from 53% to 61% in that same period. While comparing podcasts and music services isn’t exactly apples to apples (talking versus music), at its very basic level it’s all audio content and it’s up to marketers to serve up the content that draws people in, just like with any other platform. Luckily for podcasters, knowing what listeners like is about to get a lot easier due to a recent announcement by Apple. On June 9, Apple announced (at their developers’ conference) that the next iteration of their podcasting app will include some basic analytics capabilities; something that podcasters have been asking about for years from the podcast host. According to Adopter Media, Apple hosts 70% of podcasts and up until now, they’ve largely ignored these requests, possibly because they take the privacy of their users seriously. Granted, the data provided will be aggregated (and anonymous) performance data. But it’s better than what had (or hadn’t) been available. Podcasters were only able to see when a user downloaded an individual episode; you never knew if the listener finished it or if they dropped out a few minutes into it. In fact, Edison Research learned that 45% of people only listened to “most” of the podcast. Content creators were flying blind. Social media platforms like Facebook and Twitter gave marketers detailed usage information; therefore, they could provide highly targeted content. Podcasters basically put something out and hoped for the best. It’s no secret that once you start providing content that listeners want and enjoy, they’re more likely to interact with it in the form of continued downloads and even sharing. Once the listeners start flocking in, so will the advertisers. This development can be a real game-changer in the podcasting world. In their State of the Media: Audio Today 2017 report, Nielsen lists news/talk/information as the second most listened-to radio formats, capturing 11.1% of the listening audience behind only country music (13.6%). Since they’re a similar format, why aren’t more people listening to podcasts? According to the recent survey of more than 2,700 people by Bridge Ratings, there are a couple of possible reasons. They found that nearly half (48%) of respondents don’t currently listen to or have never listened to a podcast because they don’t know how or where to look for them. Another reason, according to the Bridge Ratings study, is that nearly 25% of people who have listened to podcasts before found the content to be boring, too long and rambling, or poorly hosted. The first two of those can probably be remedied now that there’s more robust analytics available. As far as the last reason, chances are bad hosts don’t know they’re bad (other than no one ever downloading their episodes, of course). The final reason is that people don’t have the time or patience to seek out podcasts, according to 27% of the people surveyed. With talk radio, it’s a matter of just turning on the device. With podcasts, a listener must make a concerted effort to access the episode. In today’s instant gratification society, people just don’t want to be bothered. Other than keeping an eye on the metrics, adjusting your audio content as needed, and making podcasts easily accessible, marketers have an uphill battle when it comes to increasing the number of listeners they have. It’s important that it’s easy to find and subscribe to your podcast. Tutorial videos like the one below can shorten the learning curve for prospective audience members. Put your podcast on the homepage of your website and cross-promote it on your other social media channels with direct links. Put out content on the same day so people learn when to tune in. 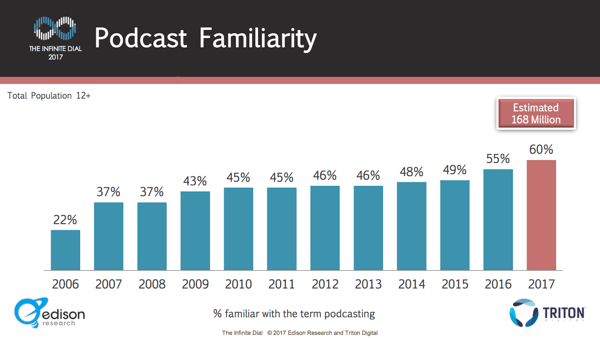 While it may seem like podcasting is growing at a slower rate than other content platforms, that’s not the case. Due to the lack of analytics, it was difficult for content creators to know what listeners wanted to hear, meaning there’s a good chance that hosts weren’t capturing as many listeners as they could have if they knew what their audience liked and disliked. Now that there are more analytics available, chances are more people will discover and enjoy the rich world of podcasts. What do you think? Does podcasting work for you? 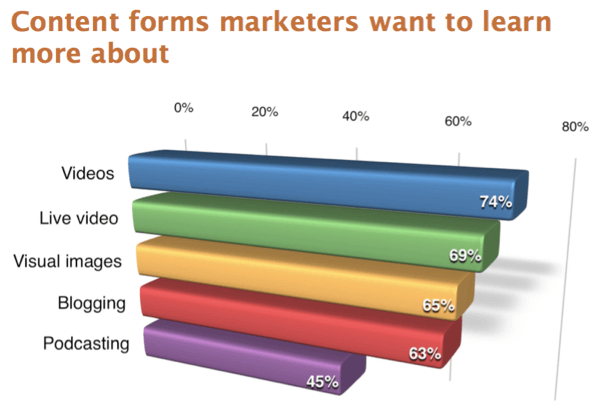 How do these insights affect your future marketing plans? Share your thoughts in the comments below.